Federated Church. What kind of name is that? It sounds more like a bank or credit union doesn’t it? In fact, it is the name of an unusual, imaginative and compassionate congregation rooted in both the history of this community and two of the country’s oldest denominations. In the Gold Rush Era it was difficult for congregations here on the West coast to persuade pastors to leave the more settled churches of Boston, New York and Philadelphia; too many guns and gangsters here in “Old Hangtown”! At the beginning of the era the Methodist and Presbyterian congregations in Placerville had the same problems; small congregations, buildings in need of repair, no money and a rapid turnover in pastoral leadership. Both congregations faced extinction! Their response to this possible calamity was to become a “Federated” congregation; one community, in the same buildings worshiping together with both Presbyterian and Methodist members. Federated Church was established in this way in the 1920’s and now draws members from Presbyterian, Methodist, Lutheran, Episcopalian, Roman Catholic and Evangelical backgrounds as well as folks completely new to the Christian faith and the life of the church. We now live in this community called to articulate a perspective on the Christian faith that might be described as progressive orthodoxy. We believe we are to be shaped by servant-hood, inclusivity, peace-making and simplicity while being rooted in the joy of Christ’s resurrection. ​During the Gold Rush years, among the miners there were preachers. A Methodist, the Reverend Hosford, preached in Hangtown in 1848. 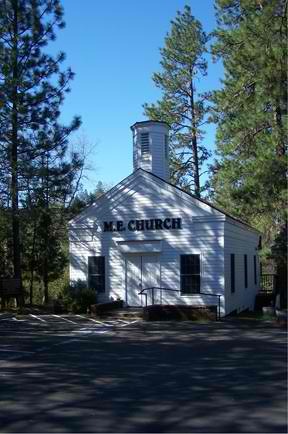 After Reverend Joseph Meek organized Methodist churches in Coloma and Hangtown, Reverend Bateman began a building program in 1851. A great debt is owed to a layman, Frank Goyan, Sr., who donated five acres of land for a church and cemetery. The Reverend traveled to San Francisco to purchase finished siding that was brought around the Horn from the East coast. Beams and studs were hand adzed from local timber ... and so the little church was built and dedicated. It served the community well for 10 years, sitting up on the hill, escaping the fires that were so devastating to the town. The church was a beacon of hope to the early settlers through the fires, epidemics, and other difficult and challenging times. In 1852, John H. Clark of Cincinnati, Ohio and a neighbor organized an overland expedition to Sacramento. John Clark's diary tells of their arrival in Placerville on September 1, 1852, putting up at the Ohio House. He was surprised at the size of the town "full of life, full of people, full of business." After fulfilling his contract to deliver his passengers to Sacramento, he returned to Placerville, helping to rebuild the town after the 1856 fire. He had little luck in mining and returned to Ohio in 1857. They moved later to Kansas and his grandson presented his papers to the Historical Society. Among his photographs is one of the church on the hillside.